Touchscreens on mobile handheld devices can detect if and where a user is touching the screen, but standard technology cannot determine how much pressure is being exerted. Now, researchers at the University of California San Diego and the University of Texas at Austin have demonstrated a new technology for 'force sensing' that can be added to any type of display, including flexible devices, and potential other uses go far beyond touch screen displays on mobile devices. Before he graduated from UC San Diego's Jacobs School of Engineering, electrical and computer engineering alumnus Siarhei Vishniakou (Ph.D. '16) worked with colleagues including his advisor, electrical engineering professor Shadi Dayeh, to spin off a startup company, Dimensional Touch. He was also accepted into the NSF I-Corps I and II programs that help academics commercialize new technology. Since then, the team has demonstrated that zinc oxide-based thin-film transistor sensors can be easily integrated with existing commercial integrated circuits widely used to control touch screens (in which a variant of zinc oxide, indium gallium zinc oxide, is already used). "It has been known for generations that zinc oxide has good piezoelectric properties and manufacturers already use indium gallium zinc oxide in displays," said Dayeh. "So it seemed that using zinc oxide in a thin-film transistor would seamlessly integrate into the process flow already used by manufacturers of touch screens." Dayeh's team developed and optimized the technology so that it simultaneously functions as a transistor and as a force sensor. 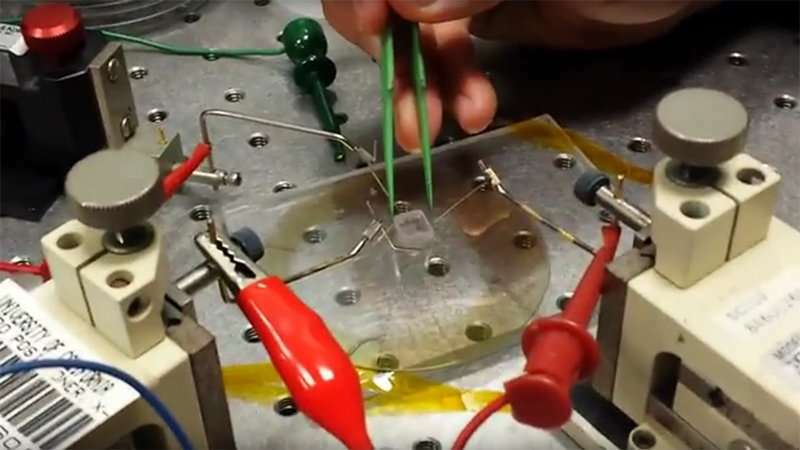 "We've determined that we could improve the transistor performance and the pressure-sensitivity by doing the zinc oxide deposition in an oxygen-rich environment," said first-author Vishniakou. "The cost of the technology is also reduced because it can be integrated into a display at the backplane level." Dayeh is the senior author on a paper published online Jan. 22 in the journal Advanced Materials Technologies. In addition to first-author Vishniakou, Dayeh's co-authors include three other graduate students in his Integrated Electronics and Biointerfaces Laboratory – Renjie Chen, Yun Goo Ro and Cooper Levy – as well as Christopher J. Brennan and Prof. Edward T. Yu from UT Austin's Microelectronics Research Center. The UT Austin researchers primarily pioneer scanning probe measurements and performed the piezoelectric force measurement of the thin-film transistor devices built by their collaborators from the Integrated Electronics and Biointerfaces Laboratory at UC San Diego. Dayeh, whose expertise spans an innovative blend of nanoscale electronic materials and devices and their use in biointerfaces, also has appointments in the Department of NanoEngineering and the Materials Science and Engineering Program, both at the UC San Diego Jacobs School of Engineering. Force sensing permits users to draw on a transparent touch screen much as they might with a pencil or paint brush to draw a thinner or darker line by pressing lightly or with greater force on paper or a canvas. While Apple's force touch technology introduced in iPhone 7 required adding an extra layer under the display, the newest technology can add force sensing to any type of display, including flexible and lightweight displays. Production could also scale up faster, because the zinc oxide thin-film transistors can be built on thin glass wafers that bend. According to Dayeh, the team worked with flexible glass from Corning Inc. that is 100 micrometers thick, and built an array of 16x16 elements that effectively can bend with the backplane. "We demonstrated that you can have uniform and reliable performance across the thin-film transistors on the array even on these thin bendable surfaces," added Dayeh (pictured above right, with alumnus Siarhei Vishniakou). 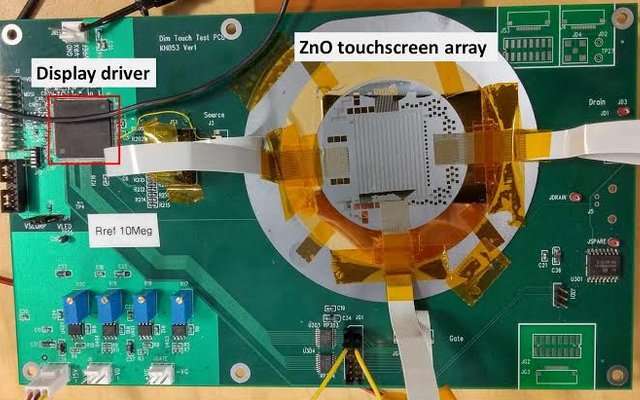 "The sensors based on zinc oxide thin-film transistor technology can be easily scaled to very large areas due to the simultaneous operation of each sensor as a switch," noted Dayeh. "We also optimized them for excellent pressure sensitivity, a high on-off ratio for the transistors, and low latency." 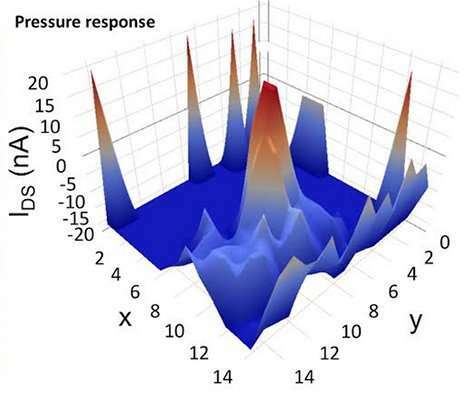 Indeed, latency – the delay in response time for the sensor to detect the presence of pressure – dropped to less than one millisecond, which is better than current delays considered sufficient for successful commercialization of arrayed pressure sensors. Furthermore, according to the paper, the team believes that there is still "significant potential to improve the device's temporal performance and sensitivity." The experiments at UC San Diego were carried out, in part, in the Qualcomm Institute's Nano3 cleanroom facility, which forms the core of the National Science Foundation-funded San Diego Nanotechnology Infrastructure (SDNI), a member of the National Nanotechnology Coordinated Infrastructure. Additional transmission electron microscopy work was performed at the Center for Integrated Nanotechnologies (CINT), a Department of Energy user facility located at Los Alamos National Laboratory and Sandia National Laboratories. To demonstrate the commercial viability of the sensors, Dayeh and his co-authors collaborated with Synaptics, Inc., a Bay Area company that configured an existing commercial IC controller for touch screens to measure the changes in current in the zinc oxide transistors under touch pressure (see video). "We measured increases in the current as we pressed on the transistors," said Vishniakou, "and the sensitivity was generally very high." "With the introduction of force sensing into mobile handheld devices, it becomes critical to develop force sensing solutions that are scalable, thin, light and cost-effective," said Dayeh. "We believe that the zinc oxide technology is a forefront candidate for integration into touch screen technologies because it is semiconducting, transparent and has a high piezoelectric coefficient." In connection with the NSF I-Corps program, Vishniakou and Dayeh held talks with several potential partners or licensees for the technology. Dayeh believes the technology is still ripe for commercialization, but it may require fabrication of a near-final device that would represent a real product that a manufacturer could customize and sell without too much further R&D. "Our next step is to scale up from our existing 1'' x 1'' device area size to a real phone-sized touchscreen. We have also identified manufacturing facilities capable of running our process, and we are currently in discussion with them on the potential joint development." "There are a number of other companies trying to bring force sensing into touchscreens, but our solution is the only one that has no moving parts, is scalable to large dimensions, and is capable of integration into the display backplane using existing manufacturing equipment". Apple's 3-D Touch is one potential rival, but according to Dayeh, it adds dramatically more weight to a smartphone compared to what the zinc oxide technology would weigh when it's integrated directly to the backbone of the display. The potential cost savings by the UC San Diego-developed technology can be dramatic. In addition to displays, Dayeh believes that zinc oxide can add a new dimension to videogames. "Gaming involves a lot of interaction with the game and other players," he noted. "Because you feel the pressure and can see a near-real-time response to that pressure, this technology could provide another tool in the gamer's toolbox."